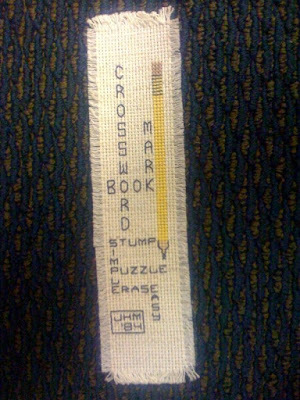 I got a call from a patron looking for his lost lost bookmark while at work today. His sister made it for him for his high school graduation. It's over 24 years old! He was really distressed about forgetting it and very excited that I was able to find it for him. It was found in Clive Cussler's "Arctic Drift". Thanks for the entry, Melissa. I will send you out an email later today so I can send you your prize. Melissa actually entered two bookmarks, and both were great. She did a great job of keeping the entries in the FB style; interesting backdrop to the image, proper paragraph format, everything... if I didn't know any better, I would think she's been working here at FB for years. I'm so glad we went on this trip together! 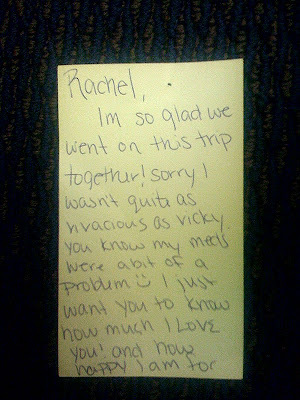 Sorry I wasn't quite as vivacious as vicky. You know my meds were a bit of a Problem :) I just want you to know how much I Love you! and how happy I am for you! I would be glad to share a bed with you any-time as long as you dont start petting me! Thanks again! Melissa, keep an eye out for that email.